Impressive earnings season enters final stretch. With more than 90% of S&P 500 Index companies having reported second quarter results, year-over-year earnings growth for the index is tracking to an impressive +24.4%, nearly 4% above expectations as of June 30. Also impressive, revenue growth is tracking to +9.3%, an unusually large 1%-plus upside surprise. Beat rates for earnings and revenue are both well above long-term averages at 79% and 71%. Finally, also impressive, forward four quarter estimates have risen 0.6% during reporting season, breaking the historical pattern of declines and suggesting tariffs have had little broad impact on companies’ outlooks. This week company reports tail off with just 14 S&P 500 companies due to report. Turkey’s latest moves to support its currency, including reducing bank reserve requirements, do not appear sufficient to stem capital outflows. Turkish President Erdogan remains defiantly against raising interest rates to support its lira currency, setting up a high-stakes game of chicken and, most likely, further market volatility in emerging markets (EM). We acknowledge the increased risk of contagion across other EM countries, but Turkey’s dependence on foreign funding is unique in EM, credit markets remain calm, and the Turkish debt load held by foreign investors is manageable (~$220 billion), increasing the odds it is a one-off. Turkey’s economy as a percentage of global gross domestic product is only about 1%, a tiny sliver compared to the U.S., while its equity market is just 0.5% of the MSCI EM Index. We maintain our cautiously optimistic view of EM equities where valuations remain compelling. This bull market is about to become the longest in history. The bull market continues to defy all doubters and is now nearing a major milestone. On August 22, this bull market will overtake the bull market of the 1990s as the longest ever (we are assuming it will make it that far). From tariffs to trade wars to inflation to a flattening yield curve to a global economic slowdown, the headlines continue to cast doubt on the lasting power of this economic cycle and bull market. Although we see several potential causes for concern, we continue to believe this economy and stock market rally have plenty of fuel left in the tank, as we discuss in this week’s Weekly Market Commentary, due out later today. Headline inflation vs. the “real story”. Though recent headline readings of inflation and proposed tariffs appear threatening, other measures central to the Federal Reserve’s analysis of pricing growth indicate less concern. In this week’s Weekly Economic Commentary, due out later today, we examine recent economic data showing the overall pricing environment may not prove as threatening as many investors fear. The week ahead. This week’s economic releases in the U.S. include NFIB Small Business Optimism on Tuesday, as well as industrial production and retail sales on Wednesday, and the Conference Board’s Leading Economic Index on Friday. 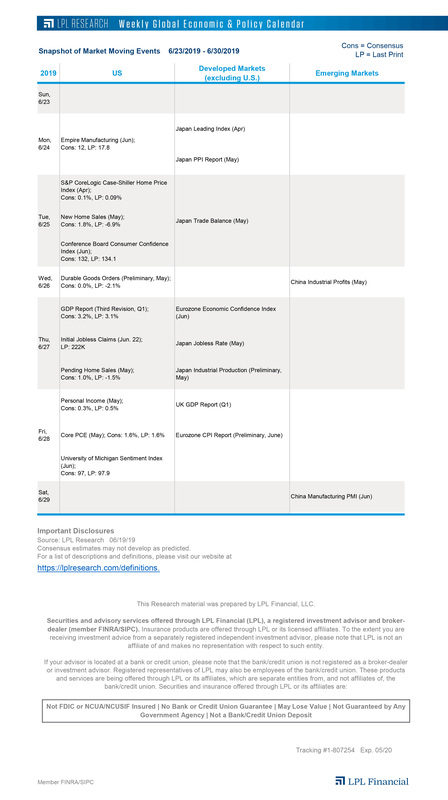 In Europe, gross domestic product and inflation data are due out mid-week, and industrial production numbers are due out of Japan and China. Meanwhile, all eyes remain on U.S.-China trade relations while some eyes are watching potential spillover following the collapse in the Turkish lira.